The Smart e-bikes Project had a stand at the Eco Technology Show held at Brighton Centre on 14 – 15 June 2013. One of the excellent cycle trainers used by the project was on hand on both days to give advice and help people who wanted to ‘have a go’ on a Raleigh Dover bike (one of the bikes used for the trials) and people seemed to enjoy the experience of whizzing around the area at the back of the ground floor of the Brighton Centre. Several people were interested in finding out more about the project and it was a worthwhile experience for the project team and a chance to meet and discuss the project with members of the public and other people interested in sustainability and alternative transport. On Friday, 14th June at a talk entitled Bupa International taps into pedal power: Will we all be riding e-bikes in years to come?, Harriet Barratt Dorling, Manager of Economic and Social Engagement in the Arts at the University of Brighton’s Faculty of Arts, gave a short presentation on the research project, its aims and methodologies. A Bupa employee who took part in the Smart e-bikes research trial gave a first hand account of how she found the experience of using an electric bike. Although she enjoyed the experience, she explained that she is a very keen cyclist and over the period of the 2 month trial she noticed that her levels of fitness had dropped. However, she did stress that she cycles every day on a normal bike and felt that for most people this would not be a problem as she believed that the opportunity to use an electric bike was mostly beneficial and more likely to encourage exercise and the use of a bike for the majority of people. Bupa International was the initial company to be involved with the Smart e-bikes Project and the data collected from the trials forms an integral part of the research for the project. Forty-one Bupa staff took part in 2 sets of trials between June and November 2012. The Smart e-bikes Research Project has recently published two videos about its work, and also features on the Guardian website. We have recently uploaded 2 videos, which were filmed during an e-bikes trial event in Brighton on 9th March 2013. The aim of the event was to raise public awareness of e-cycling, by offering free training to members of the public, and to gather information for the research project. The event was organised by the University of Brighton and Brighton & Hove City Council, and funded by the Local Sustainable Transport Fund. One video provides interviews with the participants at the event and captures their attitudes and insights. The other video concentrates on the nature of the project research – explaining its rationale, the trials involving a fleet of 35 e-bikes in Brighton and Hove, and the development of an open-source/sensor monitoring system that enables real-time display of rider data, plus research analysis. Brighton and Hove’s latest ‘Active Travel Forum’, organised by Brighton & Hove City Council, took place at the University of Brighton, Grand Parade building, on Tuesday 19th March. City Cycle Ambition grants: New funding for Brighton & Hove? People from Brighton and Hove are being invited to try out new electrically-assisted bikes in a bid to boost cycling in the UK. The e-bikes, as they are known, are being tested at a free event in Preston Park, Brighton, next Saturday (9 March) and are part of a University of Brighton-led project to increase the number of people who travel by bike. The project is led by Dr Frauke Behrendt, a researcher from the university’s Faculty of Arts, and is funded by a three-year grant from the Engineering and Physical Sciences Research Council (EPSRC). The research team has been working with Brighton & Hove Council over the past year to trial the e-bikes across the city. The public event is co-funded by the LSTF (Local Sustainable Transport Fund). E-bikes are fitted with rechargeable batteries which help when riders pedal against head-winds or up steep hills. They are very popular on the continent but have yet to become widely-used in the UK. The project partners hope that by pioneering their use in the UK, they can create more interest in e-bikes and encourage a wider range of people to cycle. At the event members of the public who have expressed an interest in trying the bikes will be able to put them through their paces. Access to specialist one-to-one cycle training for the e-bikes will also be provided. Travel advisers from the council will also be available to talk to people about their travel options in Brighton & Hove. Anyone who would like to try the bikes or receive training must register in advance, as spaces are limited. To register please complete the online survey – https://www.smart-survey.co.uk/s/70852GGOXP or call 01273 642689. The 35 bikes involved in the trial are made by project partner and manufacturer Raleigh UK. Local company Baker St Bikes is also supporting the project by providing e-bike maintenance and advice to the public, while M-Cycle is providing the e-cycle training. 3. There will be photo opportunities on 9 March with members of public testing the e-bikes and receiving specialist tuition. Please contact kathy.caton@googlemail.com for further details if you wish to attend to photograph/report on the event. 4. 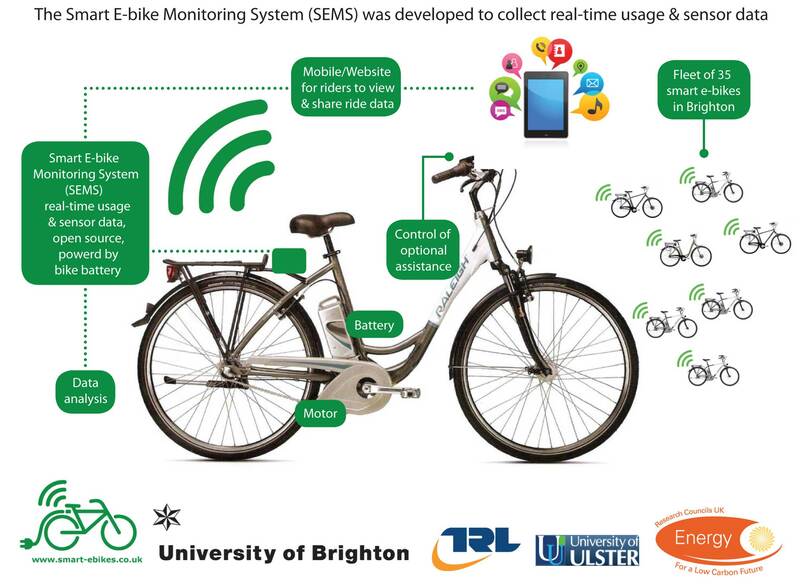 A three-year grant from the EPSRC has enabled Dr Behrendt, and colleagues Dr Sally Cairns from TRL (Transport Research Laboratory ) and UCL (University College London), and David Raffo, from University of Ulster, to set up the ‘smart e-bikes’ project. The project developed out of an event which focused on encouraging more sustainable travel behaviour, habits and practices. The Smart e-bikes project was presented at the Urban Age ‘Electric City’ conference in London on 6-7 December 2012. The conference was opened by Craig Calhoun (Director of LSE), Ricky Burdett (Director of the Cities Program), David Cameron (Prime Minister) and Boris Jonson (Mayor of London). You can watch the live stream of the conference and check out the conference newspaper and program. 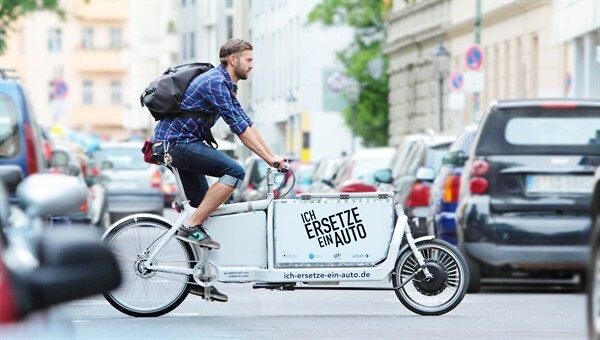 40 Electrically-assisted Cargo bikes are currently trialled by courier firms across Germany. This illustrates the diverse uses and benefits of electrically-assisted bikes. It would be great to see a similar project in Brighton – please contact us if you are interested. The bike used is called “iBullitt Pedelec Solar” made by Urban e; it can carry loads up to 100kg and has a 90km radius. In some urban areas 85% of all courier trips made by car could be replaced, and the fact that the running costs of cargo e-bikes are up to 85% lower could make it a cost-effective alternative for car couriers, according to the project website. The cargo e-bikes will be trialled in Berlin, Hamburg, München, Düsseldorf, Leipzig, Bremen and Mainz. The German magazine “Der Spiegel” also has a feature on using e-bikes for cargo transportation and couriers, arguing that these bikes have a renaissance in Germany due to them now having electrical assistance. We are presenting the research project ‘Smart e-bikes: understanding how commuters and communities engage with electrically-assisted cycling‘ at the World Cycling Research Forum in Enschede, Netherlands, 13-14 September 2012.